The Longhorn Fiji–The University of Texas at Austin Established 1883 TEXAS FIJI H Spring 2018 Renovations and Increased Security at Buen Retiro The new 22-room back addition is entering its fourth year and it has continually proven benefi- cial for the Fraternity. With the new addition and a final construction cost of just under $6 million, we raised $5.7 million through our campaign, thanks to you. In regards to our beloved Buen Retiro, we replaced the wood floors last fall and painted and replaced the ceiling on the main floor over spring break. Last year, we completed the fencing and drive gates to the entire property, safely securing our assets from vandalism. In ad- dition, security lighting and cameras were added as a determent. At this time, the Purple Owl House Corporation has voted to hold off on any new capital projects, including the Chapter room expansion until our loan on the back addition is paid off. We recently paid down the loan by $166,840, which leaves a remaining balance of $573,658 (as of April 10, 2018) with Plains Capital. With the remain- ing pledges due totaling just over $200,000 and rental income from the new addition, our goal is to retire the debt within three years. The col- lection of every pledge will greatly expedite this goal and reduce ongoing interest expense. Please check to see if you have a remaining pledge due as every dollar reduces our principle loan amount, thereby expediting the loan payoff. In addition, if you would like to contribute or in- crease your contribution, please let us know and mail your check to: Purple Owl House Corporation P.O. Box 4769 Austin, Texas 78765 Thank you for your generous donation. If you ever have any input or questions, please contact Kevin Snodgrass PC '78 at kevin.snodgrass@ cushwake.com. Chapter Receives Praise in Phi Gamma Delta's Field Secretary Report This year's Field Secretary Report was over- whelmingly a great success for Texas Fiji, in- cluding organization, leadership, philanthropy, grades, involvement with both the community and university, and fundraising. 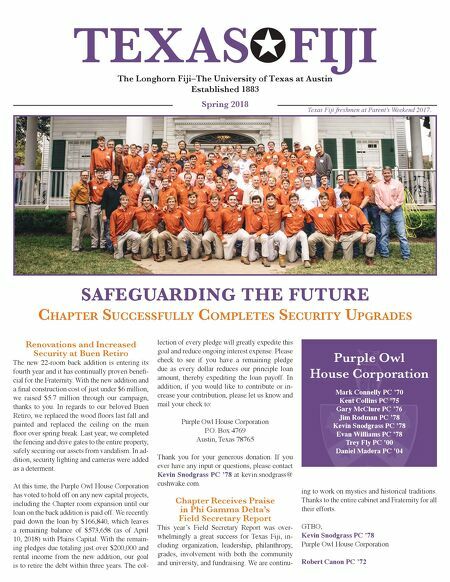 We are continu- SAFEGUARDING THE FUTURE Chapter SuCCeSSfully CompleteS SeCurity upgradeS Purple Owl House Corporation Mark Connelly PC '70 Kent Collins PC '75 Gary McClure PC '76 Jim Rodman PC '78 Kevin Snodgrass PC '78 Evan Williams PC '78 Trey Fly PC '00 Daniel Madera PC '04 ing to work on mystics and historical traditions. Thanks to the entire cabinet and Fraternity for all their efforts. GTBO, Kevin Snodgrass PC '78 Purple Owl House Corporation Robert Canon PC '72 Texas Fiji freshmen at Parent's Weekend 2017.